Before you begin slip stitching, there are a few things to keep in mind. The first is what type of hook to use. It is best to use an inline hook with a pointy tapered tip. This type of hook makes it easy to work with slip stitches. Using a hook with a bulbous head and/or a round tip, will make slip stitching anywhere from difficult to impossible. Next, think about hook size. When slip stitching, you’ll use a larger hook than you may be accustomed to. Give yourself time to get used to this. Using larger hooks is one of the main things that makes this type of crochet drape so well. You’ll generally need two hook sizes when slip stitching – one for the starting chain and final row and a hook 4 to 6 sizes larger for the rest of the piece. The hook sizes you use will depend on your individual tension. For a solid fabric that drapes better, use the largest hook that keeps the fabric solid. For worsted weight yarn, start with hook sizes J and P. Then adjust your hook sizes from there. Note: Not using a smaller hook for the starting chain and final row, produces sloppy looking ends with loose loops. Since you lose a stitch when crocheting the first row, always make the starting chain one stitch longer than the number of stitches you need for the row. So for a first row with 10 stitches, make the starting chain 11 stitches long. Then pull the hook to tighten that last chain stitch into a knot. Once you have made your chain, begin your row by turning the chain over. 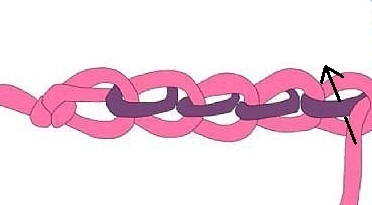 Crochet your first row into the back “hump” or “ridge” of each chain stitch as shown in the following diagram. This take a little more time than crocheting into the chain going into one of the other loops as we normally might do. However, having a nicer edge that matches the top it worth it! If you’re going to have a seam along the starting edge or if you are going to be adding onto the starting edge (to add edging, ribbing, etc. ), you can save yourself some time by just crocheting into one of the other loops as normal. Be careful about the yarn you use. Be sure to pick a soft yarn that isn’t stiff. This will help you slip stitch project to hang (drape) even better. It is best to start off using a plain yarn instead of a fun fur, slub or other novelty yarn. The textures of novelty yarn will make it hard for you to see what loops you are working with. Many find the best way to hold the hook for this type of crochet is by using the “knife hold.” In other words, hold the hook in your closed fist like a knife as if you’re eating. You may find it more than challenging to slip stitch holding your hook like a pencil. When entering stitches, use the index finger of your hook hand to help guide the yarn onto the hook. Use a light or slack tension when slip stitching. Many crocheters pull the yarn after forming each stitch. Doing that when working with slip stitches closes the stitches and makes it very hard to enter those stitches on the next row. Be careful not to yank the yarn after forming each stitch. It is not necessary to make a turning chain when starting a new row. Simply turn your work and begin the next row by crocheting into the first stitch – the stitch next to the loop that is on the hook. If you find it difficult to see where to insert the hook when starting a new row, make one chain after turning. Then pull the hook to tighten the chain into a knot. This makes it easier to see and work into the first stitch of the row. Do not skip any stitches when starting a new row unless otherwise instructed in a pattern. Making turning chains does add a little extra bulk even though you tighten them into knots. For stitch patterns where the stitches make the rows shorter (for instance, rows of back loop stitches or front loop stitches), making turning chains will make the sides of the piece a little longer than the interior. The piece will be a little wonky and won’t sit squared with nice, straight edges. So, in those cases, don’t make turning chains – especially if a pattern explicitly says not to make any. If you’re having trouble seeing the loops of the first stitch or are having trouble getting your hook into it, it means you are tightening the loop on the hook when you begin rows. After you turn loosen up your the loop on the hook a little. If you already do some SSC, you might notice that the side of your work aren’t as neat and solid as might you like. One reason this happens is related to the direction you turn the piece after each row. In crochet we typically turn the work in the same direction on every row. In SSC we need to do it a little differently. No matter whether you crochet left-handed or right-handed, you should always turn the piece in the direction that allows the yarn to naturally fall where it needs to be to crochet the first stitch. If the first stitch is a regular stitch (a front or back loop stitch), the yarn needs to be in back of the piece and the hook. If the first stitch is an inverse stitch, the yarns needs to be in front. This means that you will turn in one direction if the first stitch is to be a regular stitch and in the opposite direction if the first stitch is to be an inverse stitch. Turn clockwise, if the first stitch is to be a regular stitch. Turn counterclockwise, if the first stitch is to be an inverse stitch. Turn counterclockwise, if the first stitch is to be a regular stitch. Turn clockwise, if the first stitch is to be an inverse stitch. If the first stitch is to be a regular stitch, turn the piece towards you. If the first stitch is to be an inverse stitch, turn the piece away from you. The thing to remember, is to always turn in the direction that makes the yarn automatically fall where it should be to make the first. If, after turning, you have to do anything to bring the yarn to the front or the back where you need it to be, you have turned in the wrong direction. Following this advice should give you neater, more solid side edges.